WOOD BASE (L X W)......... 6' x 7"
MADE OF RUGGED CAST IRON WITH A 54" SOLID STEEL HANDLE. BUILT FOR HEAVY DUTY USE, WILL CUT OR BEND REINFORCING STEEL. 3/4" JAW CAPACITY DESIGNED FOR CUTTING UP TO 5/8" REBAR. 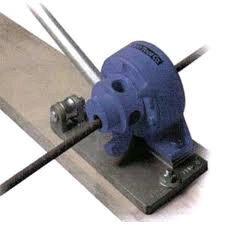 ** Please call us for any questions on our rebar cutter/bender rentals in Fairview Heights IL.